When coating cementitious substrates with reactive resins, the substrate moisture content must not exceed 4%. This ‘rule of thumb’ has become a worldwide flooring industry guideline. It is also considered a time consuming, uncontrollable and never ending problem. The consequences of non-compliance, are coating failures and financial loss. Initial damages generally appear after a very short time with further successive phases developing the full extent of the damage. Osmosis is usually indicated by the below visible symptoms. What factors determine the incidence of Osmosis? Water, soluble salts and a semi-permeable membrane can cause an incidence of Osmosis. All 3 are present to a greater or lesser extent in the installation of industrial floor coverings, especially on cementitious substrates with a moisture content >4%. When the substrate moisture content is above 4% limit, contamination by salts in or on the surface is likely, which provides the second basic condition for osmosis. 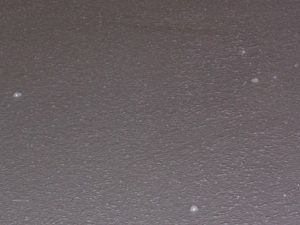 Film-forming, reactivley cross-linked coating systems with vapour barrier surfaces should always be applied in several operations or in combination with a specific primer. Damp surfaces, even with no contamination, do not allow a 100% closed, void free resin surface to be obtained. Defects can occur due to cross-linking problems or local film-forming problems. These are in the form of pores and micropores (which are always filled with salt solutions). The semi-permeable membrane is then produced. By further covering this layer, with vapour barrier top coatings, all the conditions for osmotic blistering are then present. 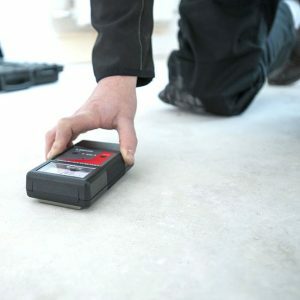 What is Concrete Humidity and how does Clifford Flooring measure this? The moisture content of fresh concrete is a measure of hydration advancement and specified how much water (according to the water/cement ratio) can theoretically still evaporate. In hardened concrete, the moisture content relates to the amount of water contained in the pores and capillaries. In normal relatively humidity conditions, this is 2-4% by weight. When additional moisture (liquid or vapour) can enter the concrete, the moisture content rises above the 4% maximum for normal coating work. Non-destructive testing before installing industrial floors is a prerequisite.